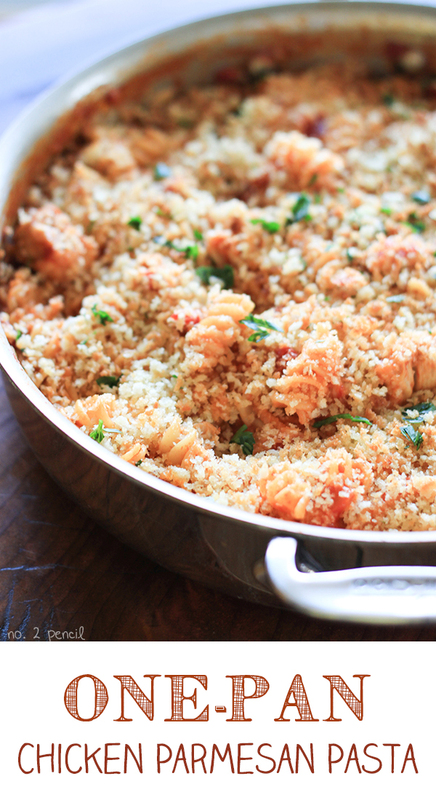 I’ve been kicking around this idea for One-Pan Chicken Parmesan Pasta in my head for weeks. It’s a combination of my One-Pan Chicken Alfredo and my Skillet Lasagna. Earlier this week, I finally had a kitchen bright enough to photograph in, thanks to the time change and a nice sunny day. Let me just say, this Chicken Parmesan Pasta was worth the wait! 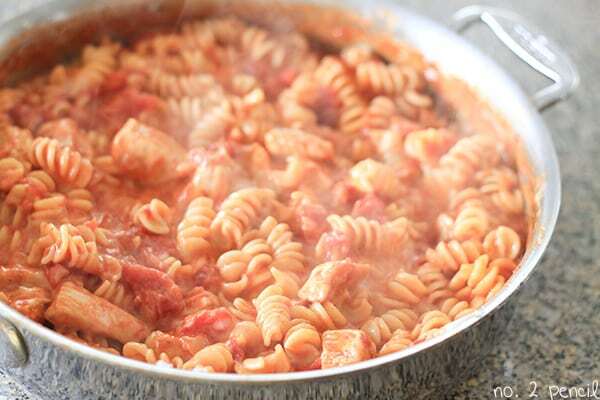 Tender chicken and pasta in a flavorful homemade red sauce, mixed with mozzarella and parmesan cheese. Toasted panko style bread crumbs give this dish a satisfying crunchy finish. Chicken Parmesan with no breading or frying and you can have this dish on the table in less than thirty minutes. Start with a large skillet or sauté pan with a lid. I use this 3qt All-Clad pan . If you’re not sure your pan will be large enough, you can use a pot too. Sauté the onions, brown the chicken, then add the garlic and cook for a minute or two. Add the garlic in after browning the chicken so it doesn’t burn. The chicken just needs to brown, not cook through, as it will continue cooking in the sauce. 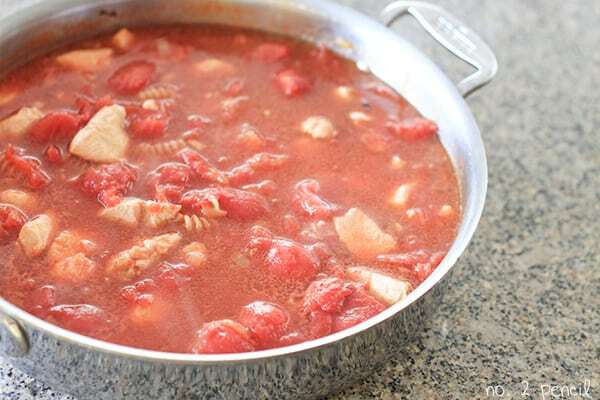 Then add tomatoes, tomato sauce, chicken broth and uncooked pasta. In this recipe, and for most of my recipes with canned tomatoes, I prefer to use whole canned tomatoes. I like the fresh taste and texture. In a quick cooking dinner like this, I just use my kitchen shears to break up the tomatoes a bit while they are still in the can. If you want to skip that step, just substitute crushed tomatoes or diced tomatoes. Cover pan and cook on low for about fifteen minutes, or until pasta is tender. Taste and season with additional salt and pepper. Stir in mozzarella and parmesan cheese. Just look at the yummy, steamy, cheesy pasta! If you are cutting back, you can easily skip the mozzarella cheese altogether and just add the parmesan. It will still be just as flavorful! Since chicken parmesan is traditionally breaded, we are going to toast some panko Japanese style breadcrumbs right on top of the pasta. 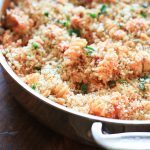 The panko style bread crumbs are lighter and crispier than traditional bread crumbs, so they give this dish a delicious crunch! Just combine them with a little olive oil, sprinkle over the top and run the dish under the broiler for a minute or two. Watch the breadcrumbs closely because they will brown very quickly! In a 3 qt saute pan, saute onions and olive oil until onions start to soften. Season chicken with 1/2 teaspoon of kosher salt and pepper to taste. Turn pan heat to medium high and brown chicken pieces. Turn heat down and add garlic to pan. Continue cooking 1-2 minutes more. Use kitchen shears to break up canned tomatoes in the can. 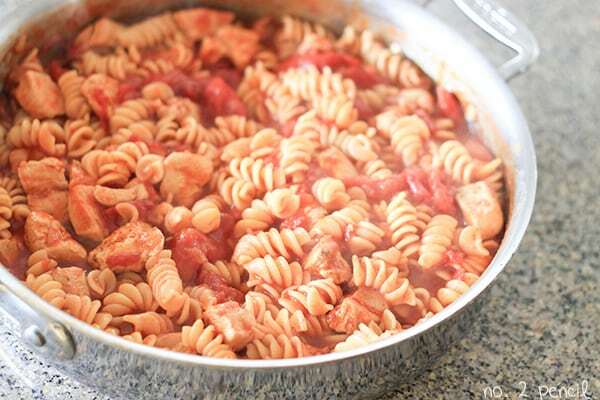 Add tomatoes, tomato sauce, chicken broth and pasta to pan. Bring mixture to a simmer, cover and reduce heat to low. Cook covered for around 15 minutes or until pasta is tender. Season with additional salt and pepper to taste, I used 1/2 a teaspoon of kosher salt and several turns of black pepper. Stir in mozzarella cheese and parmesan cheese. In a small bowl, combine panko bread crumbs with 2 tablespoon of olive oil. Sprinkle bread crumbs over pasta and heat under broiler until bread crumbs are crispy and golden, 1-2 minutes. Garnish with fresh flat leaf parsley. See even more on my one-pot meals here. The combination of flavors sounds delicious! I made this last night and it was delicious! I added some sugar as well as milk when the mixture was boiling to cut the acidity. I was worried about how much sauce was present after the pasta cooked but after stirring in the cheese it was perfect. Thanks for sharing! made this tonight and it was a big hit. Great flavor! Novice question: why use whole tomatoes if you need to cut them? Why not just buy diced tomatoes? It’s on the stove now; can’t wait to try it! You can use either depending on your preference. We generally use whole canned tomatoes because they are peeled and breakdown nicely in the sauce. I think they have a fresher taste. But that’s just my preference! found this on pintrest looks awesome for colder winter nights – great pictures! I made this ultimate night time and it changed into scrumptious! I delivered a few sugar in addition to milk whilst the combination was boiling to reduce the acidity. i was worried about how plenty sauce was present after the pasta cooked but after stirring inside the cheese it changed into perfect. thanks for sharing!